Saving the planet is a cooperative effort, says William Hooke of the AMS Policy Program. It will also take some humility, scientific savvy, a willingness to act on limited information, and an understanding of when to approximate and when to be precise. 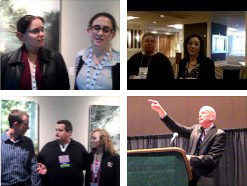 It also means dealing with a world of chaos–in short, it means thinking like a meteorologist. 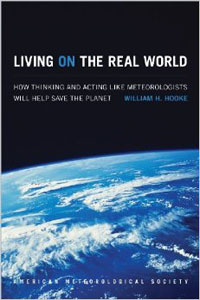 Hence, Hooke’s newly released AMS book, Living on the Real World: How Thinking and Acting Like Meteorologists Will Help Save the Planet. Hooke sat down with BAMS Editor in Chief Jeff Rosenfeld to discuss the book and the importance of collaboration in meteorological research and even management; the whole interview can be found here. Stop by to meet Bill and get a copy of Living on the Real World at the book signing event at the AMS Resource Center in the Exhibit Hall during this afternoon’s poster session, 2:30 PM – 4 PM. Copies are limited, so it’s first-come, first-served, but the book will be released soon and available at the AMS Bookstore.